Just Jingle: Anything Goes? Okay. Dinosaurs with Balloons, it is, then! Anything Goes? Okay. Dinosaurs with Balloons, it is, then! It is GIVEAWAY WEEK here at Just Jingle! If you haven't already checked out the giveaways this week, be sure to click on the blog banner and scroll down to see them all! Two Giveaways a Day (one in the morning and one in the afternoon) ALL WEEK long! Yup! It's kind of awesome! 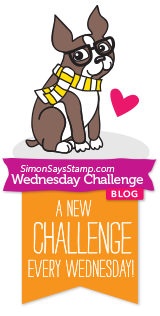 It is time for a brand new challenge over at the Simon Says Stamp Wednesday Challenge and this week it is ANYTHING GOES! Yup! You can create anything you would like and link it up for a chance to win! The Design Team is featuring Newton's Nook and Lil' Inker Designs products this week! WHAT? Yup. Two of my favorite suppliers of CUTENESS!!! I pulled out the super cute Prehistoric Pals set from Newton's Nook along with the Balloon Dies from Lil' Inker Designs for my card. I colored the cardstock with Spectrum Noir markers before die cutting to get nice, even custom colors! LOVE THAT! A Lil' Inker sentiment was a perfect fit for this playful design! You can enter the challenge up to FIVE times, but your projects must be NEW. One lucky participant is going to win a $50 Voucher to the Simon Says Stamp Store! WHAT? Yup. Totes, dudes. Totes. Go link up! Also, don't forget to check out all of the GIVEAWAYS on my blog this week!!! Two a day, EVERY DAY! Yup! It's pretty fabulous. For reals, though. I think Dinosaurs with balloons are pretty cool actually, love the colours you chose Jen! OMG, how could I never see dinosaurs with balloons before? I'm totally going to copy your idea because it's awesome! Way too cute! I am so happy Simon Says is now carrying Newton Nook's products! I adore Jen's stamps! Sure to make someone smile, Jennifer! Love the twine balloon strings! So cute! Love the bright colors, sprinkling those stars around was the perfect touch. GAH! I love dinosaurs with balloons. It's just unique and FUN!!! heehee cute card.. love that dino..
Super cute Jennifer!! A dino with balloons!! Love it!! Wish I had more time to compete. It would be fun love balloons. Hi Jingle --- Love this fun and happy card...I'm sure it will be a big hit for any child and I also love the vibrant colors. It's been a blast hanging with you DT gals at SSS! Thanks for your kindness and being such a joy to create with!! Lovely card!! I didn;t know LID had balloon dies!!! They go great with the cute little dino!! Well, why not? I think dinosaurs and balloons are a great combo! Fun card! Fantastic color combination!! Definitely a happy combination that will cheer anyone up! He he he! Thanks so much for the fun Dino card! I love the idea of Dinosaurs with balloons! Too cute!! A dinosaur with balloons makes perfect sense to me! !Love this card! Darling card! Love the fun balloons and that great dino! 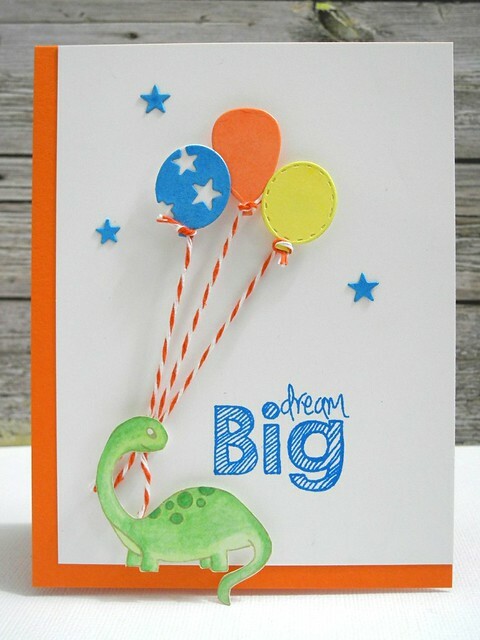 Such a fun card Jennifer, I love the cute Dino attached to the balloons - love the cut outs!! hi Jingle! 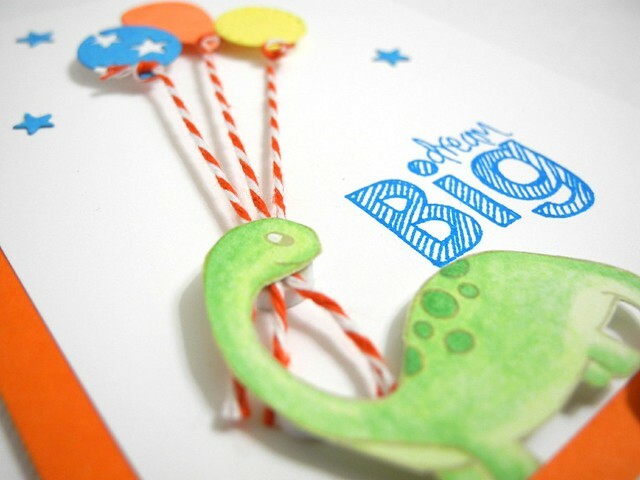 darlin card, I adore the dinosaur...sooo cute! Hope you have a fabulous weekend! Very nice...love how the dino is holding the balloons. This sentiment and its font is perfect. LOOOOVE! I have a hard time with little guy cards - even though I raised two of 'em! And you gotta' look at it from their point of view - a dinasaur with balloons makes PERFECT sense - pretty fab colours too! Oh your card is adorable. I LOVE it. Thanks so much for sharing.